New to self-storage? We're here to make it convenient and easy for you. You may find it helpful to watch our video, "How to Store," where you'll quickly discover how Public Storage simplifies the process for you. With thousands of locations across the U.S., we aim to provide our customers the convenience of having a Public Storage facility located right in your neighborhood. With our expertise and strong belief in our goal to provide only the best storage solutions, our loyal customers have made us the largest self-storage company in the world. See what some of these customers have to say about their storage experience. Public Storage is truly your one-stop destination for everything you need when it comes to moving and storing. We not only provide the widest selection of storage types, you'll also find the best ways to pack, protect, box and store just about anything you can bring us. So stop on by. We're sure to make your next move conveniently easy. For most units you'll pay just $1 for the first month's rent.† That's our way of saying thank you and welcome to Public Storage. Reserving your space at Public Storage is always free and easy. No credit card is required, and there's absolutely no obligation. For more information about this process and what it means to reserve, go to Reserving. On your first day, you'll get a personalized entry code for the electronic security gate. You'll then be free to come and go anytime during Gate Hours. For more information about accessing your unit, go to Your Account on your desktop or mobile device for 24/7 access details and more. 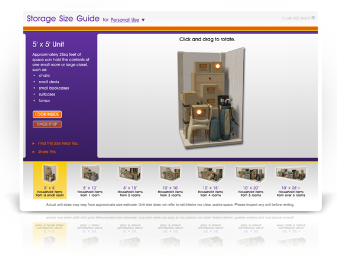 To help determine the unit size that fits your needs, be sure to try our Size Guide. You'll find property managers at each location who are self-storage experts. Be sure to see them for help with selecting the perfect unit, storage tips, or even borrowing handcarts and dollies. We believe in making self-storage easy. From finding your perfect unit and making free reservations, to providing tips to help you pack—all the way to getting you moved in and enjoying your new storage life. For more, watch "How to Store in Five Easy Steps." And we look forward to seeing you around the orange doors soon! With thousands of locations, it’s easy to find the right one for you. Enter your zip code above or use our Location Finder to get started. Learn More. We offer storage units large and small with a variety of features to suit your needs. Use our online Size Guide to find the perfect fit. Learn More. Fill out the online reservation form to hold your unit and lock in your price. There's no cost, no obligation and no credit card needed. Learn More. Take advantage of our useful Packing Tips to help you pack like a pro. Top-quality boxes, tape and packing supplies are available for purchase at the property. Bring your things to the property, meet your manager and sign your lease. Take advantage of our helpful Storage Tips when loading your unit. Learn More.